U.S. Army and H-47 teams marked the delivery of the 300th CH-47F Chinook to the U.S. Army on Oct. 15, 2014, at the Ridley Park, PA, facility. 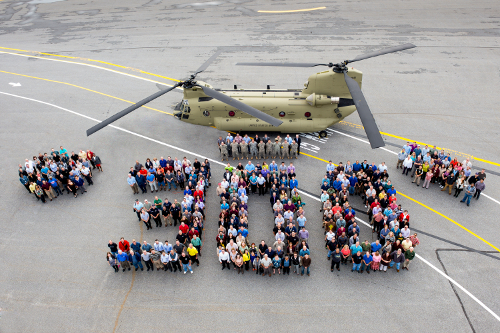 RIDLEY PARK, Pa., Oct. 27, 2014 – Boeing [NYSE: BA] this month delivered to the U.S. Army, 75 days ahead of schedule, the 300th CH-47F Chinook helicopter. The CH-47F has a modernized airframe, Common Avionics Architecture System (CAAS) cockpit that improves crew situational awareness and the Digital Automatic Flight Control System (DAFCS), which offers enhanced flight-control capabilities for the multitude of conditions in which the helicopter is used. Since the completion of the first CH-47F Chinook in 2006, 18 U.S. Army and National Guard units have been trained and equipped with the aircraft. “The efficiency we have demonstrated is keeping the Chinook a highly relevant U.S. Army asset today and into the future,” said Parker.